Your Descent group plays regularly at your friends' house or someplace else? The base game box should be relatively easy to transport. But the larger and more individual your Descent collection becomes, the greater the need for the right transport solution. We made up our minds about that and and found a solution for you. 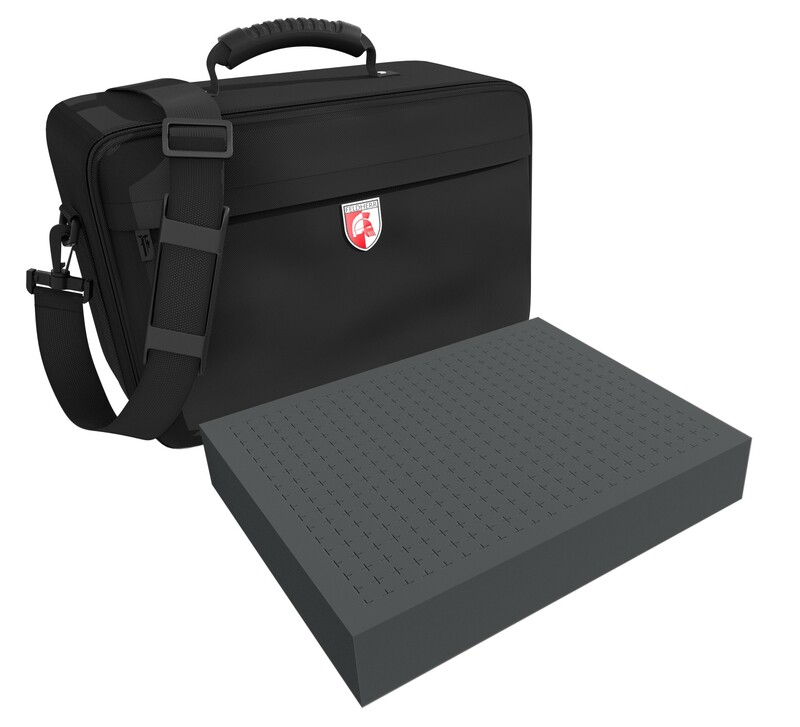 The Feldherr MAXI bag for Descent: Journeys in the Dark Second Edition comes completely filled with four custom-made half-size foam trays, as well as a large customizable Pick and Plug foam tray. 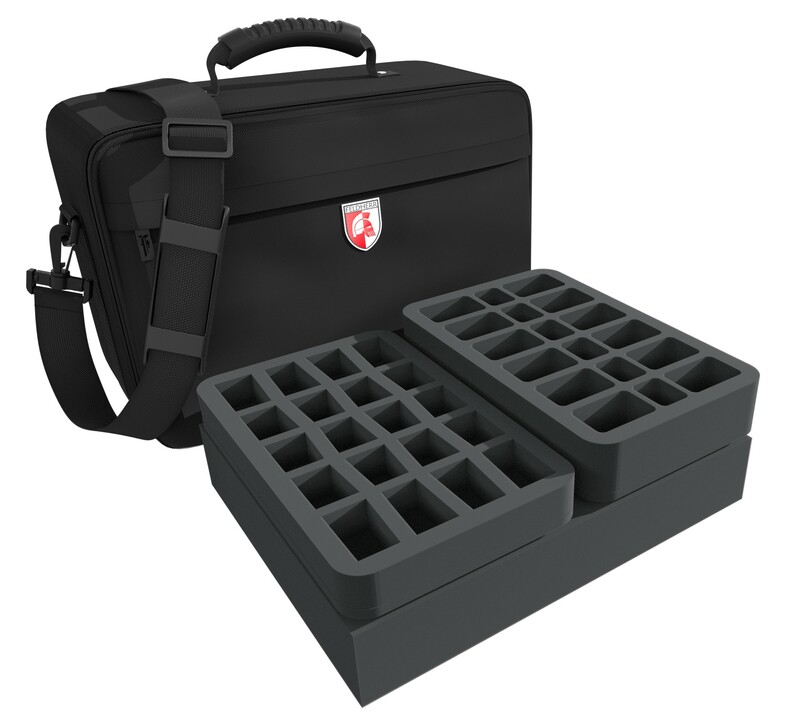 One half-size foam tray with 16 compartments. 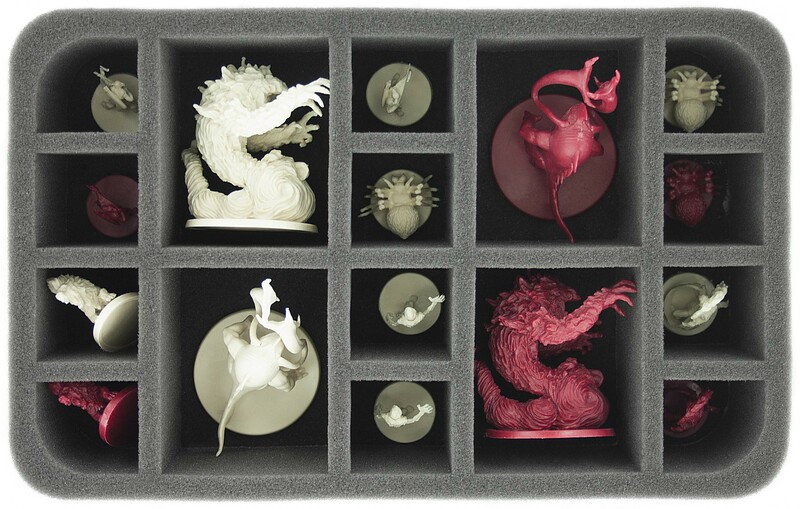 It is divided into 12 compartments for small hero and monster miniatures. 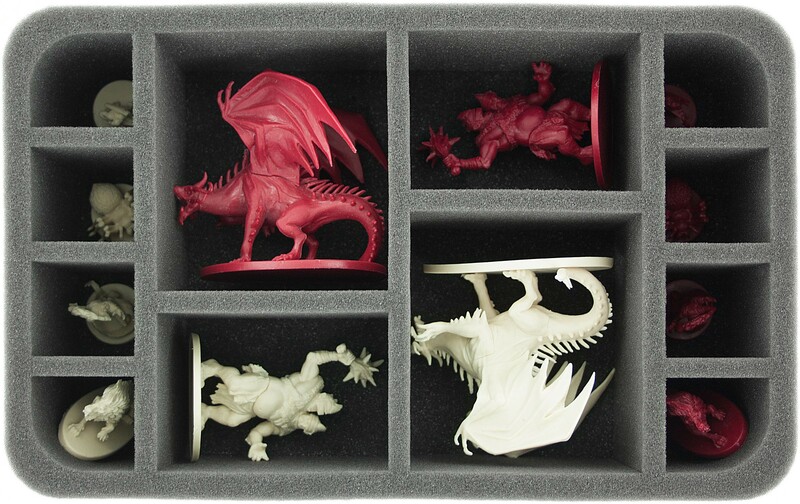 Plus four additional compartments for large monsters such as the Elementals. The foam tray has the dimensions: 275 mm x 172 mm x 60 mm total height (incl. 10 mm bottom). One half-size foam tray with 12 compartments. Consisting of two big compartments for the Shadow Dragons, plus two spaces for the Merriods. Additional eight compartments provide shelter for other small hero and monster figures. The foam tray has the dimensions: 275 mm x 172 mm x 75 mm total height (incl. 10 mm bottom). 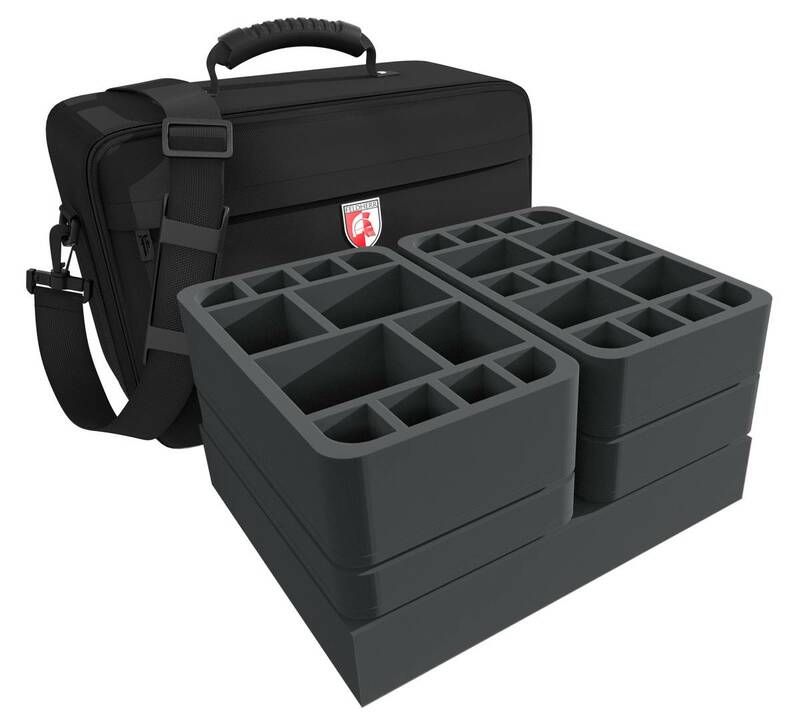 One half-size foam tray with 18 compartments. 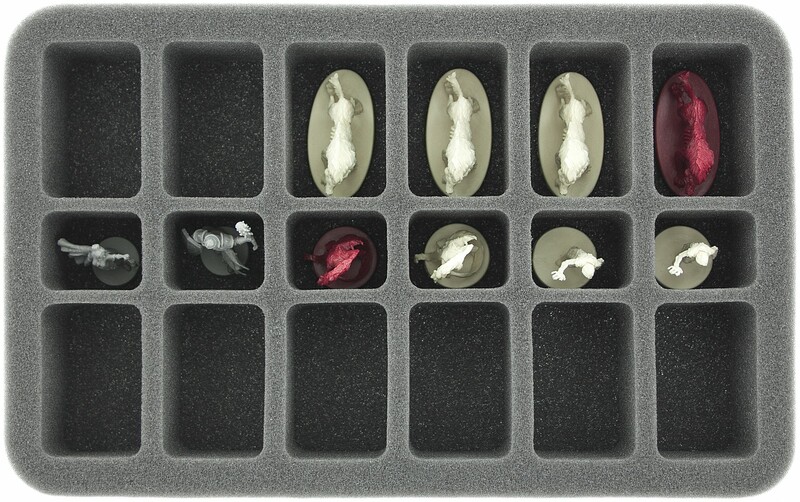 12 compartments for medium sized heroes and monsters, such as the Barghest, plus 6 compartments for small miniatures. The foam tray has the dimensions: 275 mm x 172 mm x 50 mm total height (incl. 10 mm bottom). One Half-size foam tray with 20 conical compartments. Here 20 heroes, monsters or lieutenants can be clearly stored horizontally. The foam tray has the dimensions: 275 mm x 172 mm x 35 mm total height (incl. 10 mm bottom). In addition to the prefabricated foam trays, the MAXI set comes with a Pick and Plug foam tray in Full Size. Thanks to the perforation (14 mm x 14 mm), you can adapt these to your individual needs. For example, if you still need space for cards or markers, or for captains who are not yet accommodated in the other mats, then you simply design it yourself. Quick and easy. The foam tray has the dimensions: 275 mm x 345 mm x 60 mm height. One 10 mm strong foam bottom is included. The MAXI bag also contains the suitable foam topper to protect the collection from above. 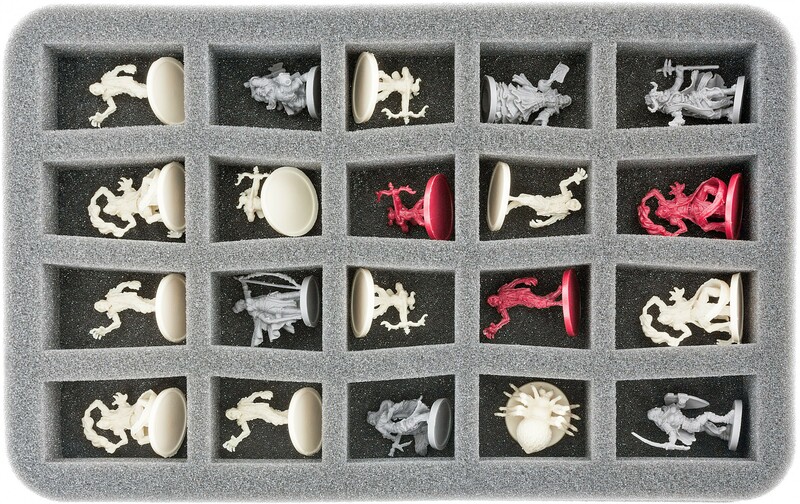 Tailor-made foam trays prevent the figures from slipping or colliding. Colors of painted miniatures do not flake off. Sensitive parts such as swords, claws or wings are protected from bending or breaking. 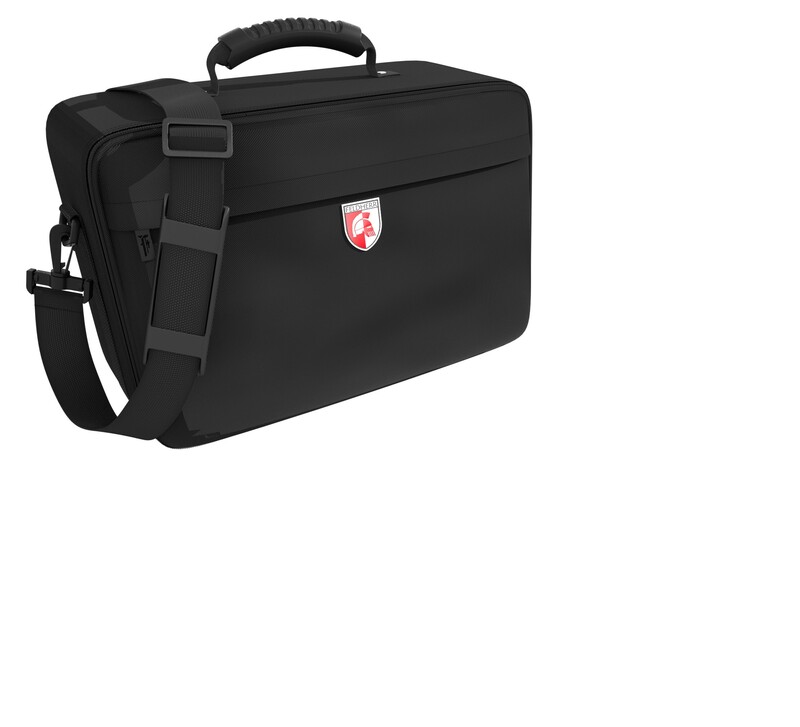 The high-quality MAXI bag has padded side panels and a reinforced bottom, so that the contents are always safe, even when transported by car or train. A sturdy belt provides additional comfort. This should get everything ready for your next trip to Terrinoth.